For The Suburbs Arcade Fire has managed to sneak the album title into the lyrics of almost every song, but it's not just a gimmick. The band manages to capture a broad scope of lamentations about life outside the city, what it means, and how living in sprawl effects the directions we take in growing up. Throughout the incredibly even-keel and primarily dour album, Win Butler and the band tell stories about moving to the suburbs and wanting kids, losing sleep living in the city and having to trade life in the city for something more docile. It's as much about growing up being a constant process of trial and error as it is about doing what American society, and largely now much of modern society, was built upon. The Suburbs is about age, and family, and not wanting to miss the big moments that grace home movies, by living too long in the city. 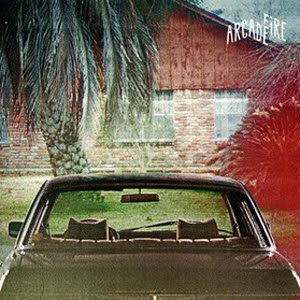 In fact, Arcade Fire seems to think that despite the city's glamor, it's an insincere, fake place. In "Rococo" the lyrics deride the ignominious blathering of greater-than-thou city kids. The song is an attack on the hipster douchebag types who have nothing to say, but churn out big words regardless. The Suburbs also deals heavily with identity. Living in the city, or in the suburbs are identifying marks on each of us. We perceive, mostly due to years of indoctrination, that people in the city are fast-paced, aggressive, intellectual and artsy, while suburb-dwellers are well-off and disconnected. But, the way that Arcade Fire's lyrical stories, and minor-keyed musical arrangements portray the suburbs as a place for being an adult, calling oneself a "Modern Man" and for building a home. The city is a temporary place in The Suburbs, a stop along the way, but the suburbs aren't any safer, they just look that way. "The Suburbs" opens with the lines "In the suburbs I, I learned to drive/And you told me we'd never survive/Grab your mother's keys we're leaving," drawing attention to how feeling safe can mean feeling trapped. And "Half Light II (No Celebration)" opens with "Now that San Francisco's gone/I guess I'll just pack it in/Wanna wash away my sins/In the presence of my friend," pulling the listener emotionally the other direction. The city isn't safe either, and it's not a solution to the suburban-boredom problem. If anything, Arcade Fire seems ready to assert that it's never where we are, but who we are that matters. You can't escape unhappiness by feeling the 'burbs for the city, or hustling out of the city to the sprawl. Wherever we go, we're eventually set to confront ourselves. As an album that is as thoughtful as this one, The Suburbs doesn't bombard the listener with the ornate constructions and complex melodies found on Funeral and Neon Bible. Arcade Fire is decidedly more reserved, presenting stories that touch everyone who has grown up thinking the grass is always greener, dreaming of big things in bigger places, and quiet times in smaller ones. To claim The Suburbs as a concept album is to do it a disservice. This is a musical essay, or more so, a music short-story collection. Each tale runs back to the heart of the issue: we define ourselves by where we are, when we should really define ourselves by who we are.